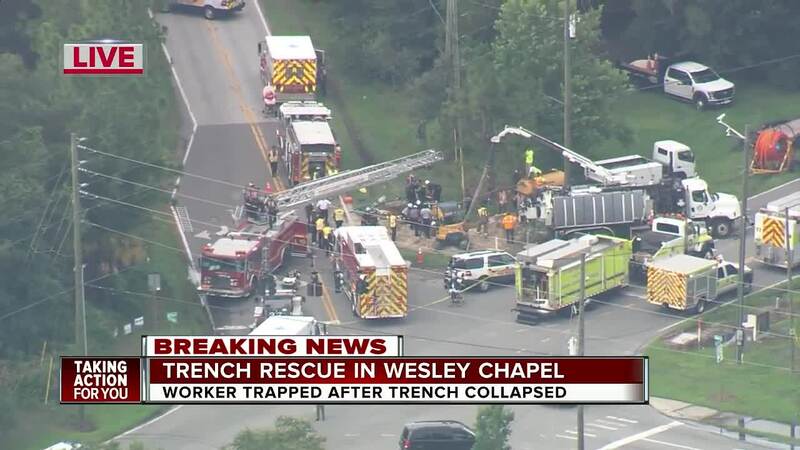 WESLEY CHAPEL, Fla. — Emergency crews rescued a worker after a trench collapsed in Pasco County on Monday. The worker was alert and talking after being pulled from the hole. Pasco County Fire Rescue responded to the intersection of Old Pasco Road and Quail Hollow Blvd in Wesley Chapel around 3:45 p.m. When firefighters first arrived, they said the worker was trapped in the collapsed trench with water near his chin and rising. They immediately stopped the flow of water from a nearby drainage ditch by shoveling sand to make a makeshift dam, stopping the water from going into the trench. PCFR also requested the assistance of the Hillsborough County Fire Rescue trench collapse team. Firefighters shored the side of the trench to prevent further collapse and a track hoe was secured to prevent it from falling in. Vacuum trucks, shovels, and water were used to break apart the sand the worker was trapped in, freeing him after nearly two and a half hours. After he was pulled out, the man was flown to a local hospital for further evaluation, but he was alert and conscious.